Way back in 2003, Sony designed the first cell phone to feature a dedicated front facing camera. The Ericsson Z1010 was far ahead of its time and was released years before the Apple iPhone would be. Marketed towards business professionals, one of the top demographic of cell phone users at the time, the front facing camera wasn’t meant to be a selfie machine per se, rather a tool for on-the-go business meetings. As general usage of cell phones grew beyond just for professional use, the camera became a staple. This often forgotten device ushered in a new era of what a cell phone is and certainly what it could be. Today, millions of selfies are uploaded to social media every day. Between Facebook, Instagram, and Snapchat you’d be hard-pressed to go a day without seeing one. Luckily for the 95% of millennials who have taken at least one in their life, the stigma and labels of selfies being narcissistic and vain are gone. What was once considered an attention-seeking faux pas is now an encouraged part of social media interaction after all, who doesn’t love to see their friends feeling confident enough to post a self-portrait? Heading the game of selfies is Snapchat, the photo sharing dedicated social media network that’s always been the selfie king-pin. Thanks to their iconic roll out of the first mainstream AR selfie filter, remembered simply as “rainbow barfing,” selfies have truly never been the same. Perspective on the selfie monopoly had by Snapchat can be seen from the content of Instagram which holds selfies as only 4% of total posts on the platform. Comparatively, more than one in three people who use Snapchat do so primarily just to take and send selfies. 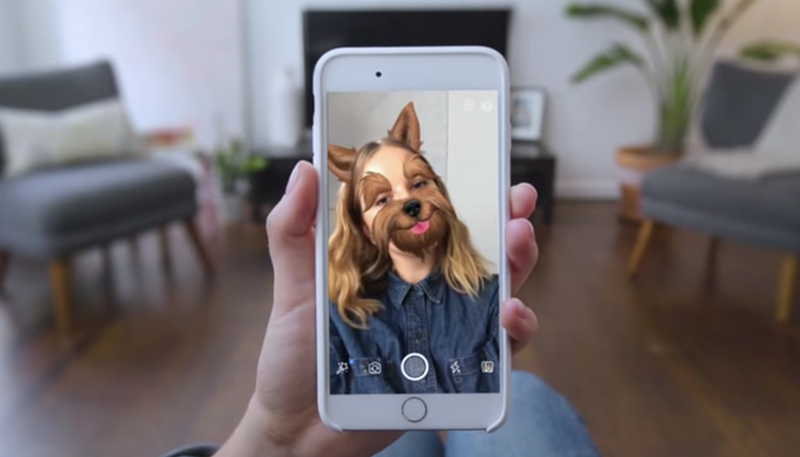 Both platforms may be selfie friendly, but Snapchat has the upper hand with its use of AR. The technology that makes AR selfies possible extends further than just our personal photos. Facial mapping software is constantly being developed to work smarter and faster. By identifying key points and peaks on a user’s face, such as the cheekbones, eyes, and mouth, every Snapchat filtered photo becomes entirely unique. Movement isn’t a hindrance either, as this mapping adapts to fail movement in real time and even adjusts for more than one person in the photo frame. These advancements open the doors to experiences we could have only dreamed about in the past. From games and entertainment, to selfies, and even security, augmented reality is showing to be a much more viable and useful “edit” to our reality than even virtual reality on its own. Launched in 2017, the long anticipated iPhone X hit the shelves. Boasting completely updated features, drastic redesigns, and new technology, nothing stands out more in the phone than its unique facial recognition security. No longer forcing users to require on breakable passwords and four-number pins, facial mapping technology is built right in with the Apple Face ID. Though a face consists of eyes, a nose, a mouth, etc, each one of us has features that are uniquely ours and what better way to confirm our identity than with our own face? Moving beyond just phone security, facial mapping is becoming a more viable option for other security measure every day. In fact, more than one in three European consumers say they would feel more secure using their own selfies as passwords for their banking, and even instant payments with just a snapshot could eliminate the need for our wallets and credit cards. How do you make your selfies stand out? Take a look at this infographic from Frames Direct for more on the impacts of augmented reality on our perceptions of self, security, and beyond.